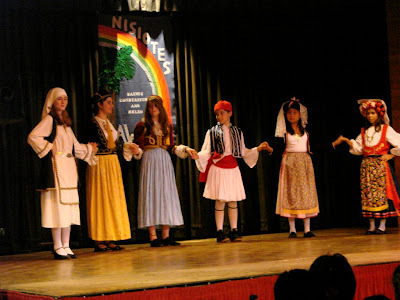 Today we have a picture of the Nisiotes dance group who performed various Greek dance number in native costumes for the thousands of people who attended the Hawaii Greek Festival over the weekend. Click here to see a video of one of their dance numbers. Thousands attended the festival and were treated to delicious Greek food such as gyros, moussaka, souvlaki, spanakopita & baklava. There were also tons of crafts and performances like the above one. There was also a live band playing and many people took to the dance floor to try their hand at the Greek dances because for one weekend as the organizers proclaimed “Everybody is Greek today”. It’s hard to imagine that over two decades have passed since on of Hawaii’s most successful ethnic celebrations - the Okinawan Festival - made its debut at Ala Moana Park’s McCoy Pavilion. Who could have imagined back then that the event would grow to attract over 50,000 people from all over the world, involve more than two thousand volunteers, and be staged at Waikiki’s biggest park? A weekend full of continuous live performances by entertainment groups from Okinawa and local Okinawan groups at the Kapiolani Park Bandstand. You’ll be treated to Hawaii’s best Okinawan music, dance and cultural groups, as well as special guest performers from Okinawa. Plan you day with this schedule of events. Don’t forget to check out the cultural tents, Machiya-Gwa country store, Hanagi Machiya Plant fair, children’s games and much more. You can even enter their Okinawan Festival 2009 Photo Contest and you may win $100. Eat your way into history as the first winner of the Andagi Eating Contest! Contests will be held at the Kapiolani Park Bandstand on stage between performances. You’ll have to chomp down three andagi as quickly as possible! Cheer on your favorite andagi lover as they eat their way to win! Saturday at 2:30 pm and Sunday at 10:05 am at Kapiolani Park Bandstand. Andadog – Okinawan version of the corndog. A hot dog on a stick that is dipped into Andagi batter and deep fried and more! The HUOA’s Okinawan Festival Shuttle Bus will run continuously during the Festival. Park free at Kapiolani Community College and ride roundtrip in a cool air conditioned bus to Kapiolani Park. There is a storage compartment on the side of the bus for baby strollers and large bags. In addition, the bus drivers will happily assist passengers in getting on and off the bus. $1 return tickets can be purchased at the Information Booth. 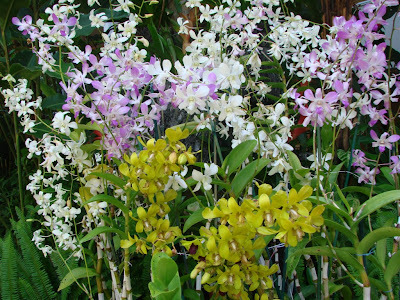 This is a display of the many colorful types of orchids that can be found in Hawaii. This was in the garden area of the Marriott Hotel in Waikiki. You can commonly see orchids on hiking trails and in peoples yards as many stores in Hawaii sell potted orchids much like those shown here. It makes for a nice plant to bring over to somebody’s house as a gift.